If Olafur Eliasson wasn't already one of the world's most interesting living artists, he would be my very favorite science museum exhibit developer. 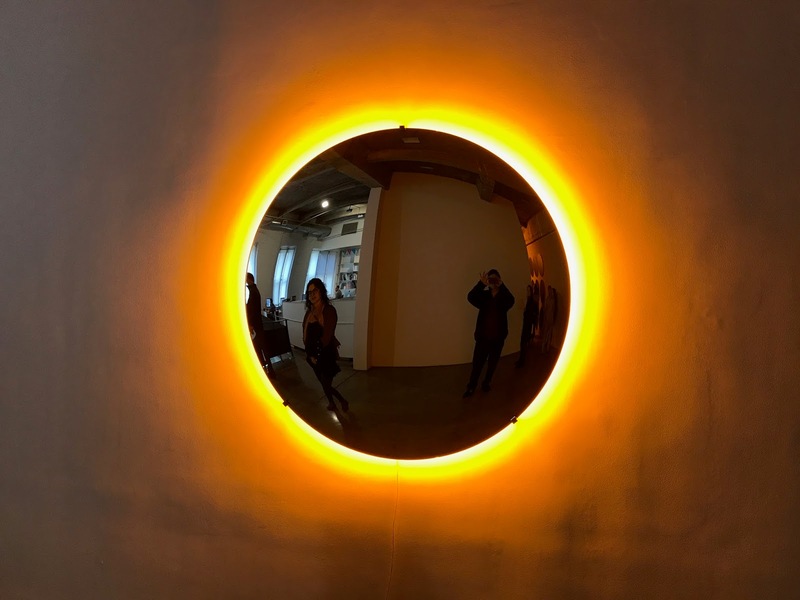 Eliasson's elegant grasp of the connections between art and science are on display in his show entitled "The listening dimension" currently on view at the Tonya Bonakdar Gallery in New York City. Each of the pieces packs a big visual punch starting with Rainbow bridge, a series of glass spheres that have sections of mirrored, colored, and back pieces placed so that balls of color shift and change depending on your position --- creating eclipses, rainbows, or mirrors. 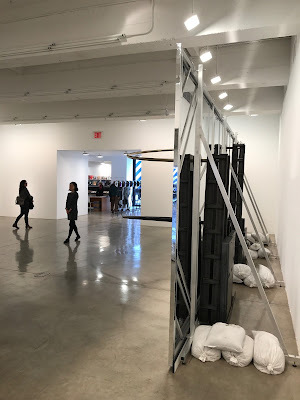 Three room-sized reflective panels, The listening dimension (orbit 1, orbit 2, and orbit 3) , form the centerpiece of the exhibition. 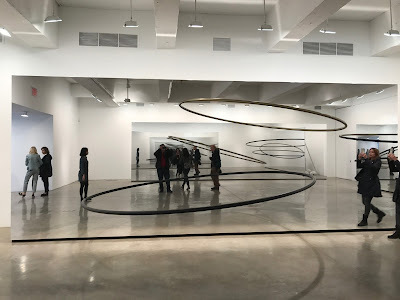 As you enter the room you see a set of what appear to be rings floating in space. But as you approach the reflective walls and look behind, you realize that Eliasson has created a carefully-crafted illusion, and the rings disclose themselves as semicircular tubes mounted to frames behind the mirrored surface. This aspect of "revealing the perceptual trick" is classic Olafur Eliasson, and one of the reasons I find his installations so appealing. Upstairs, the artist continues to play with light and perceptions. 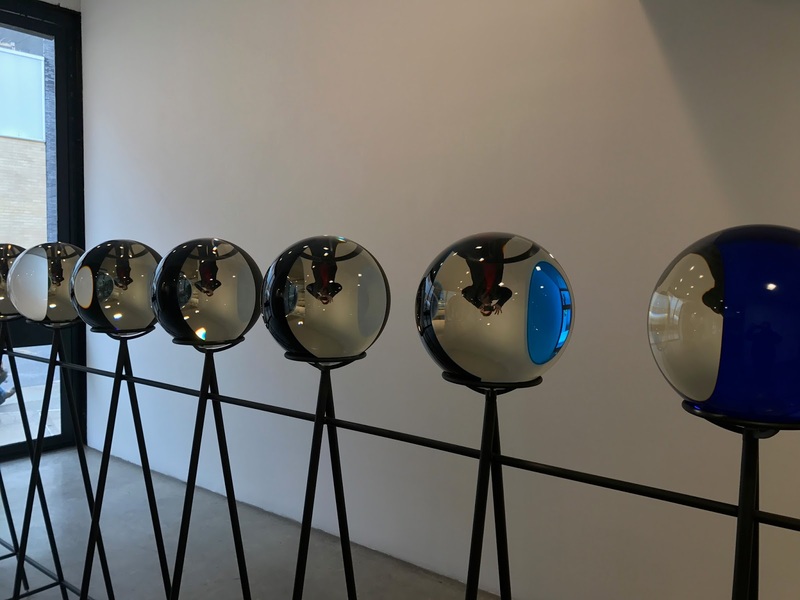 Midnight sun creates a visual dialogue between intense light and a concave mirror to give the viewer a sense of peering into a portal to another world. One of my favorite pieces in The listening dimension is Colour experiment no. 78. As you enter a room bathed in a yellow sodium light you notice a series of vaguely monochromatic circles. In the center of the room hangs a long cord with a round knob at the end. 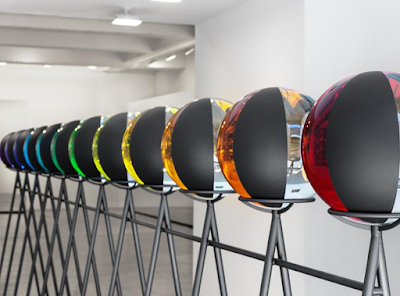 When somebody pulls the cord, a large incandescent lightbulb hanging from the ceiling illuminates and instantly changes the circles to a series of different-colored paintings. But what really changed? Colour experiment offers a big Wow! followed by a quieter Aha! 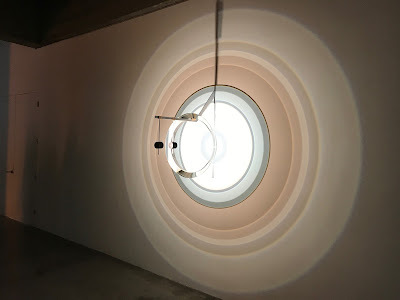 as viewers think about and investigate the experiment Eliasson has provided for us. While the craft of the experience is completely evident, Eliasson also invests time and resources in working with scientists. 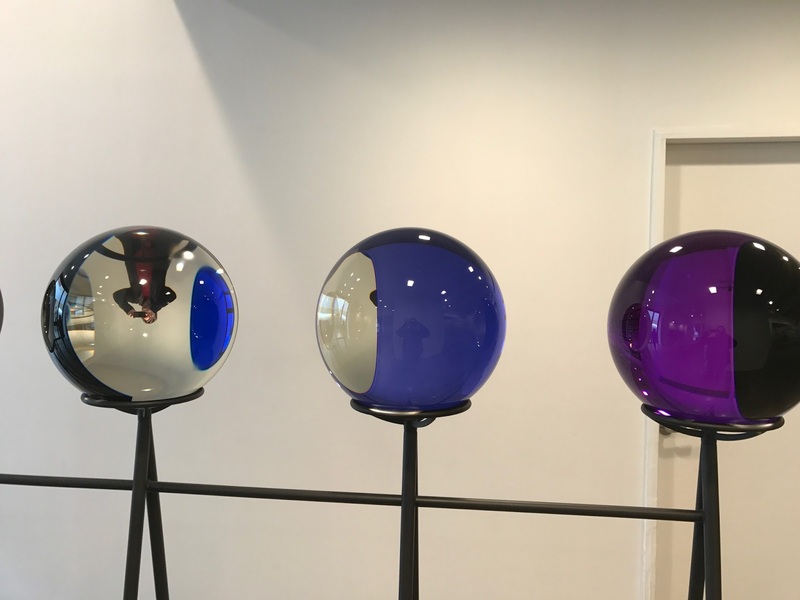 This particular piece is the result of Eliasson’s ongoing research into color phenomena, a process that began by working with a color chemist to create colors that match each nanometer of light in the visible spectrum. 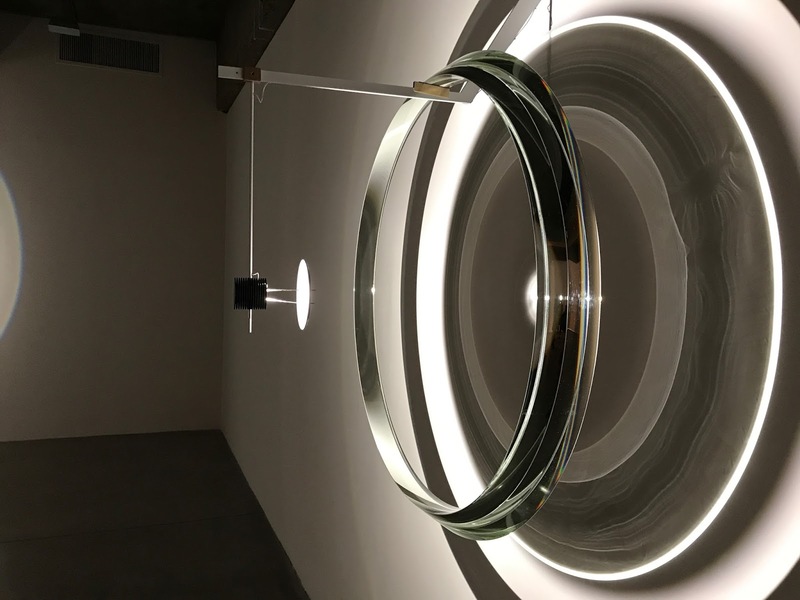 The last piece that Olafur Eliasson has put together is a room filled with point-source lights and the rings from a deconstructed Fresnel lens, of the type found in lighthouses. Eliasson experiments with combinations and positions of light and lenses to create stunning effects of light, shadows, and spectra. I really can't say enough about the impact of Olafur Eliasson and his art. I encourage you to check out his website and to seek out opportunities to view his work in person at galleries or museums around the world. Labels: aha!, art and science, design inspiration, exhibits, Olafur Eliasson, The listening dimension, wow!